You will earn 1,229 Reward Points. Earn 1 reward point for every 1 dollar spent. Complete your kitchen with the Geneva 74420S Classic Series Room Service Table. This item is 31 inches tall. 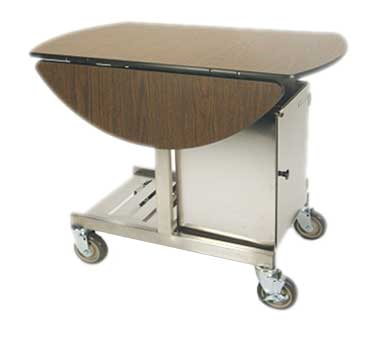 Available with DuraTopTM high-density black polyethylene top for extra durability long life, made of recycled materials. Unit shall feature a frame of either black powder coated steel or stainless steel square tubing construction with a laminate table top. Top shall have leaves with either bi-fold (fold down) or tri-fold (fold up or down) design. Top shall feature flip-up design with convenient lock release knob. Frame shall accommodate one or two food carrier boxes by Geneva or others. Frame shall feature stainless steel fold-up box platforms to allow nesting table storage. Casters shall all-swivel stem-mount with 5" non-marking cushion tread, two each with brake.